Water is essential for everyday activities and we need to replace that water that we lose each day through urine, sweat and breathing otherwise we are likely to become dehydrated. It is recommended that you drink about 8 glasses of water a day, which works out at around a glass of water every two hours while you are awake. It is best to do this at regular intervals throughout the day, rather than waiting until you are thirsty, although drinking more in the first part of the day is perfectly acceptable if you are concerned about being up all night! Water has many vital functions in the body and is essential for maintaining optimum health. Water can help reduce constipation and improve digestion. Water is an important component of blood, which is needed to transport hormones, chemicals and nutrients to all parts of your body. Many of your cells' biochemical processes need to take place in water - including metabolising fat! Water carries waste material away from your cells to your kidneys for elimination. Water absorbs and transports heat, helping maintain your body's temperature. Dehydration jeopardises the most basic processes in the body and can provoke a diverse array of symptoms including: fatigue; headache; light-headedness; dry skin, mouth and eyes; and lack of concentration. Tips for increasing your water intake. Drink a glass of water as soon as you get up to rehydrate your body. Don't wait until you are thirsty to have a drink - you are already dehydrated by then. Fill a large bottle of water each morning and keep it with you at work. Take a small bottle of water with you whenever you go out. Set the timer to remind you to establish a habit of drinking water. Drink before you eat - you may be thirsty rather than hungry! Keep track of your water intake by using Nutracheck's water meter in your Food Diary. 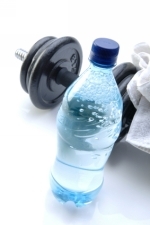 And remember to increase your water intake in hot weather and when you exercise.